The first national celebration of Memorial Day (originally Decoration Day) took place May 30, 1868, at Arlington National Cemetery. 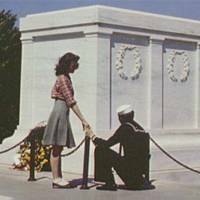 The national observance of Memorial Day still takes place there today, with the placing of a wreath on the Tomb of the Unknown Soldier and the decoration of each grave with a small American flag. The holiday has changed a bit since it first began, which some argue was even earlier than Logan's dedication.